This coat is great – quirky, with a lot of character. Plus, it cost 25L, and that includes the coat, a pair of jeans, shirts, shoes – Izumiya is really incredible when it comes to price. You need to visit this place if you haven’t yet! I like the fur collar texture especially. The creative way in which some SL designers trick us into believing that a texture is real always amazes me. I like the way the belt hangs kind of carelessly around the open coat front. I paired the coat with a pair of jeans available in a two-pack, one with black plaid trim (shown) and one with red plaid trim. A steal at 20 Lindens for the two pair. Gadge Allen has just begun designing some jewelry and accessories. These pride earrings, aptly called “Hell YES I’m Proud!” are fashioned after a necklace he said he got from a bubble gum machine (I wish I got such cool things from a bubble gum machine!). It’s great…tiny metallic rings in a spectrum of colors hang from a main silver ring. 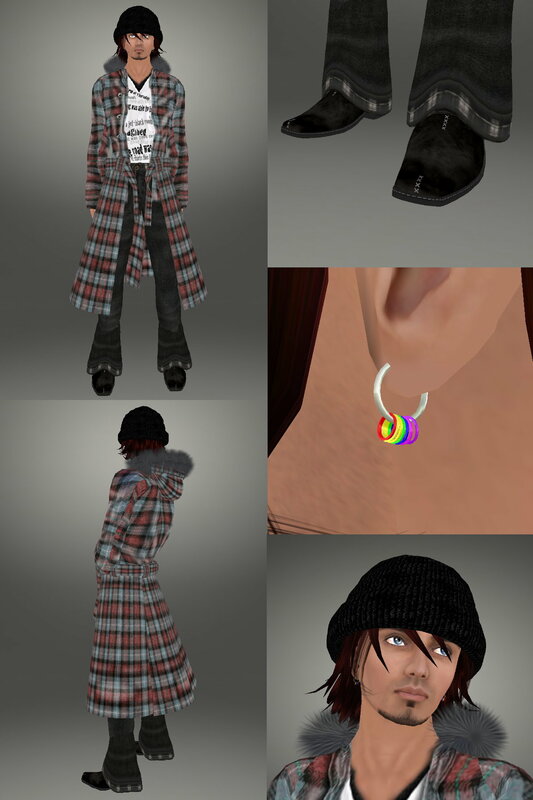 A left and right earring are included, copy and mod so you can wear multiples if you’d like. My old standbys, my black Oslos from JCS, and Smoke2 hair from Exile in black cherry, finish off the outfit. Nice post Perry! this coat is so nice!